I ended up taking three flights just to get from Bangalore to Ha Noi. The first of them dropped us at Singapore Changi airport. The transit areas are the only places where one can obtain some good sleep. We had about five hours to spend before our second flight. I spent about three of them sleeping. 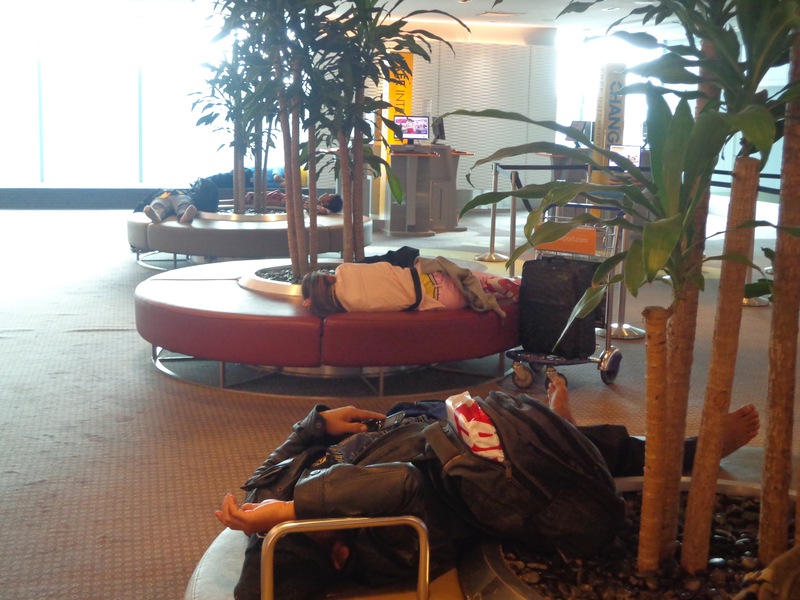 These benches at transit lounges of Changi airport are perfect for a quick nap. 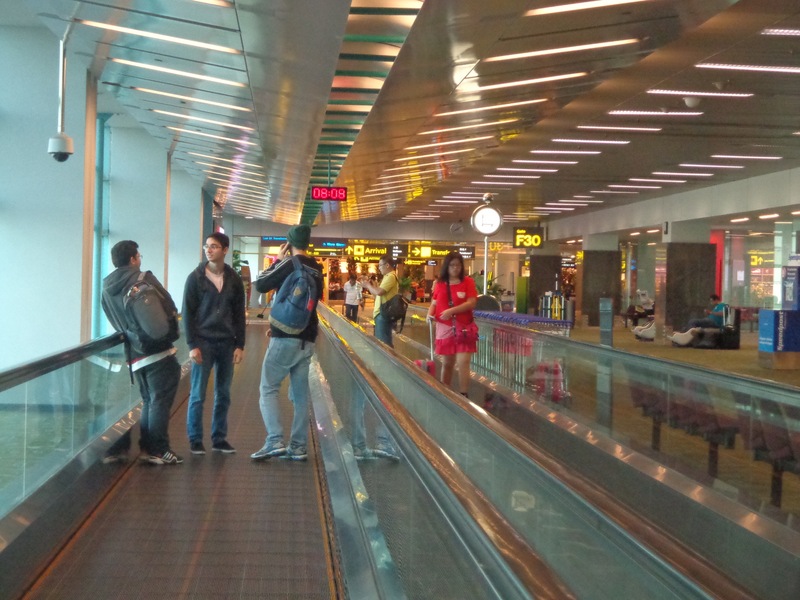 Changi airport is very commercialised. To be precise, it is laid out to attract the fashion conscious female consumers. Judging by the native Singaporeans who walked around, that must be a significant number. Entry to the huge transit mall spanning terminals T1, T2 and T3. There are booklets kept at strategic locations to encourage the brand conscious buyer. We had like 20 mins to gulp down some lunch. I had a bowl of Mee Siam while Nandy had some fish ball noodles. 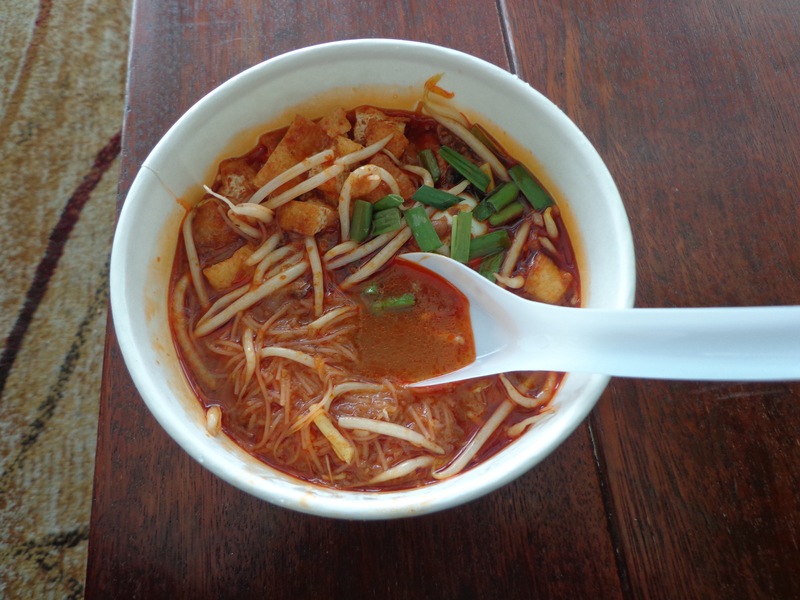 Yes, the Mee Siam was as spicy as it looks. 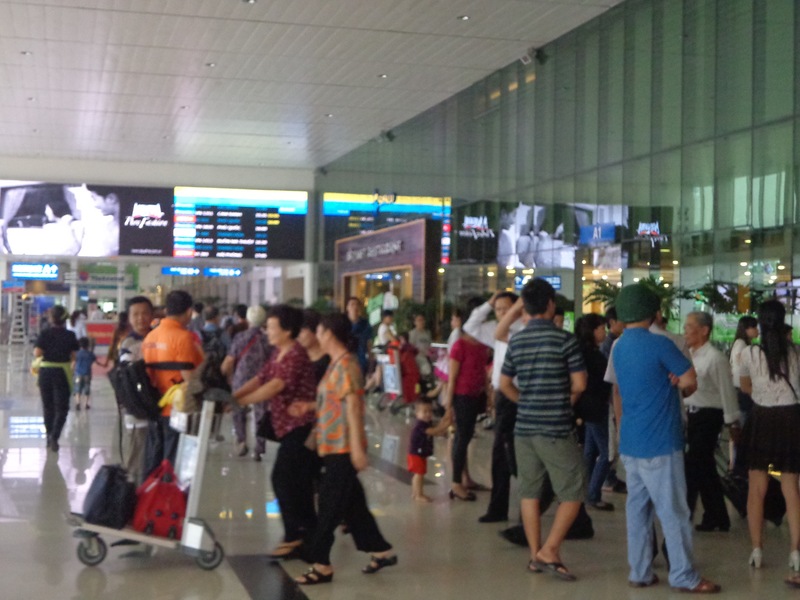 We reached Ho Chi Minh City airport (Tan Son Nhat) at about 2.00 pm local time. The visa process and immigration check was pretty swift. Since it is not the usual tourist season, we were spared of the lengthy queues about which I had read on other websites. 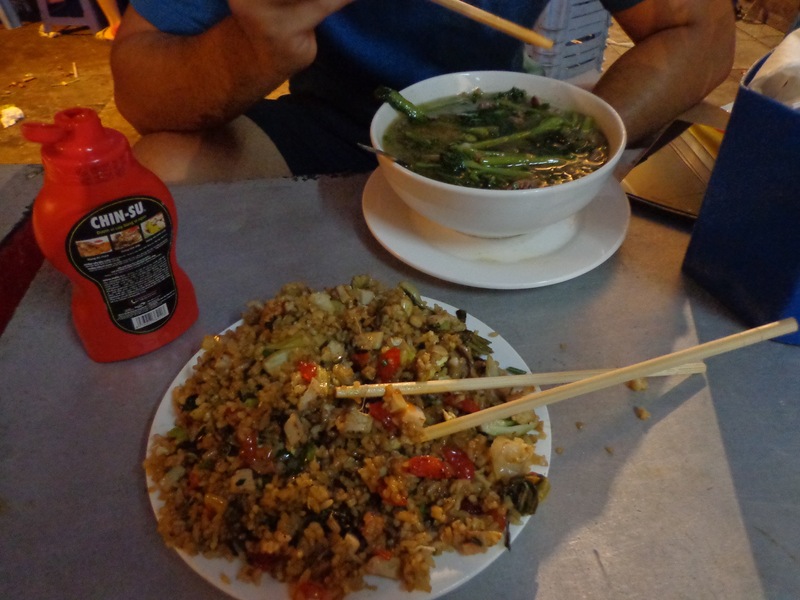 At this point, we had to do two things – get some Vietnamese Dongs and a pair of local sim cards. Both me and Nandy ended up buying Mobifone sim cards. Nandy exchanged some USD at an exchange shop while I used my ATM. ATM gave me an exchange rate of 340 VND to 1 INR. 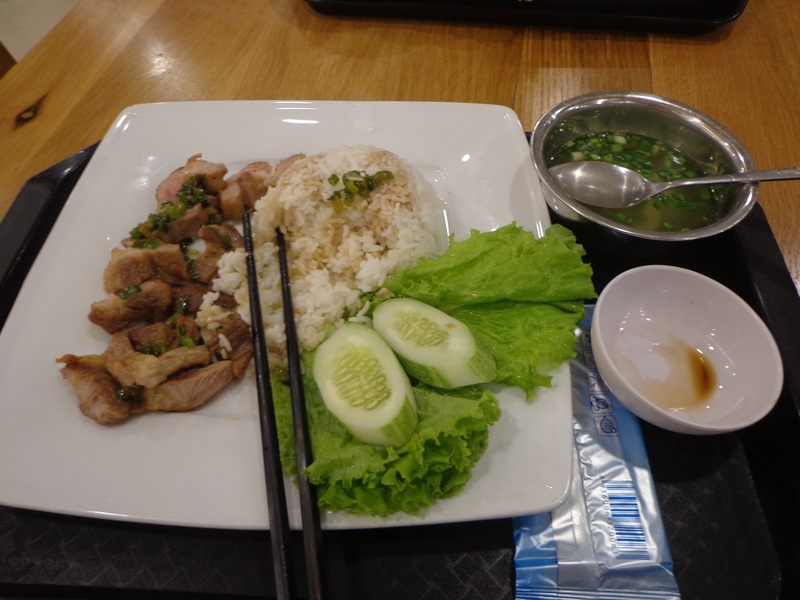 We had some time before our flight to Ha Noi that we used to compensate for the insufficient lunch. We ended up with some standard meal. The biggest surprise was Vietnamese coffee – a dense coffee concoction poured over condensed milk. The coffee is very strong. Coupled with the condensed milk, it delivered the biggest kick I have ever got out of coffee. Fried pork, steamed rice and clear soup. Tan Son Nhat domestic airport felt just like Kolkata airport. A lot of people flocked around with somewhat mild disregard to discipline. 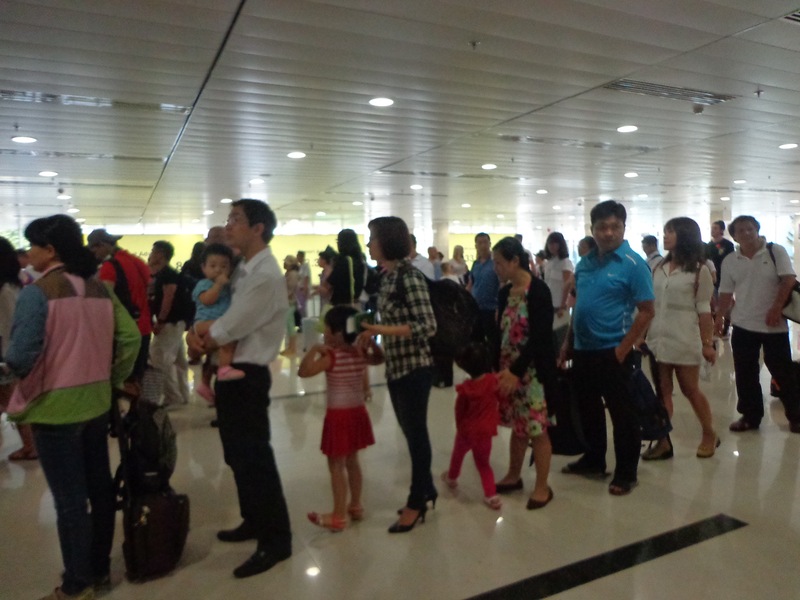 People outside the domestic terminal of HCMC airport. People “somewhat queued up” before the security checking counters. The mild lack of discipline percolated to our flight schedules as well. Our Jetstar Pacific flight operated with a 45 minute delay with respect to its schedule. 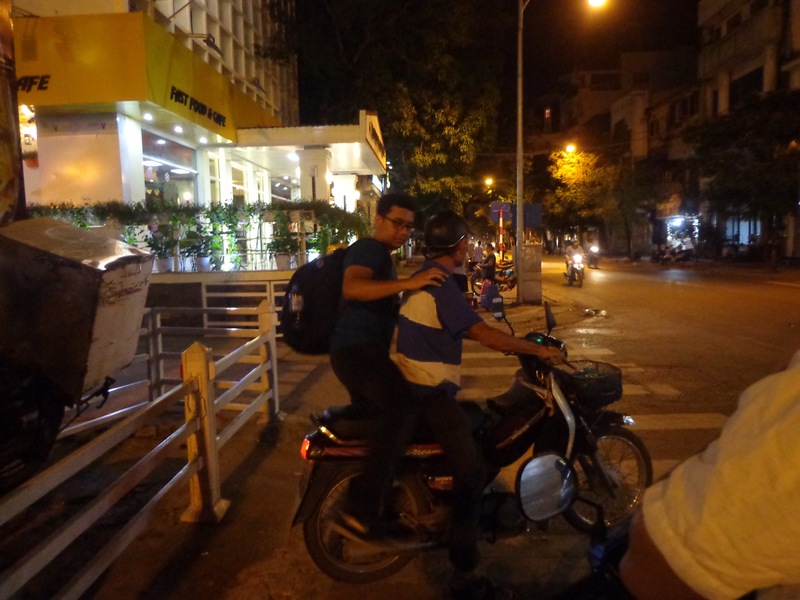 We exited Noi Bai airport of Ha Noi at 9.30 pm, a full one and half hour later than our scheduled arrival time. I was worried that we might not be able to catch our dinner. 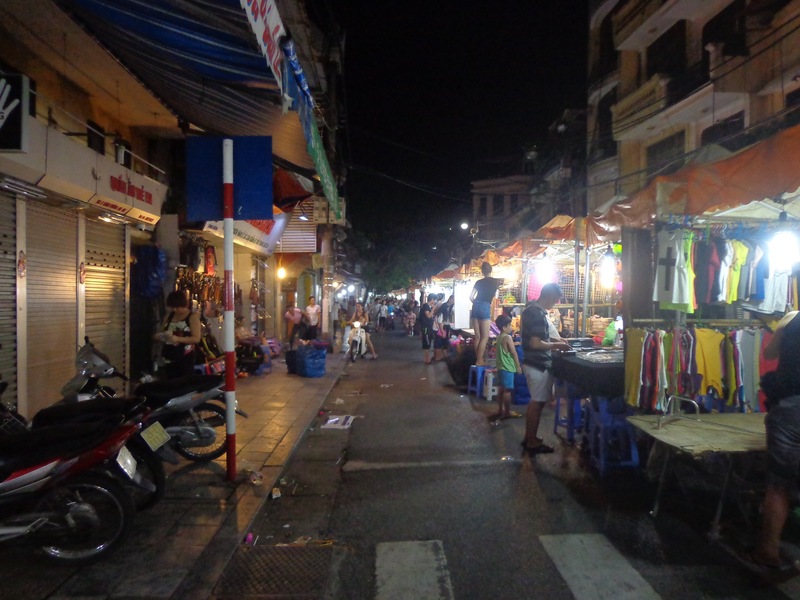 The shops were shut and Ha Noi had already started descending into darkness. One of the simplest way to reach Old Quarter from Noi Bai is to take a minivan. It costs 40k VND per person to travel about 25 kms from Noi Bai. The minivan dropped us at some junction. From there we took a paid motorcycle ride as pillion riders. With 50k per person, we ended up spending 180k VND in total. That was much cheaper than a 400k taxi ride. Nandy getting on a hired motorbike as a pillion rider. This mode of commercial transport was a new experience for me (the commercial part, not the transport part). With some help from our host Dong (Yes! He shares his name with his national currency), we ended up roaming around the Quan Chuong gate at 12.00 am in the night. A lot of women run these cheap roadside clothing and accessories shops that are reminiscent of the hawkers underneath the Sealdah bridge in Kolkata. The only difference is that these stalls are temporary. The owners are adept at packing everything up and cleaning the streets, thus removing any trace of their occupancy to any budding Sherlock. 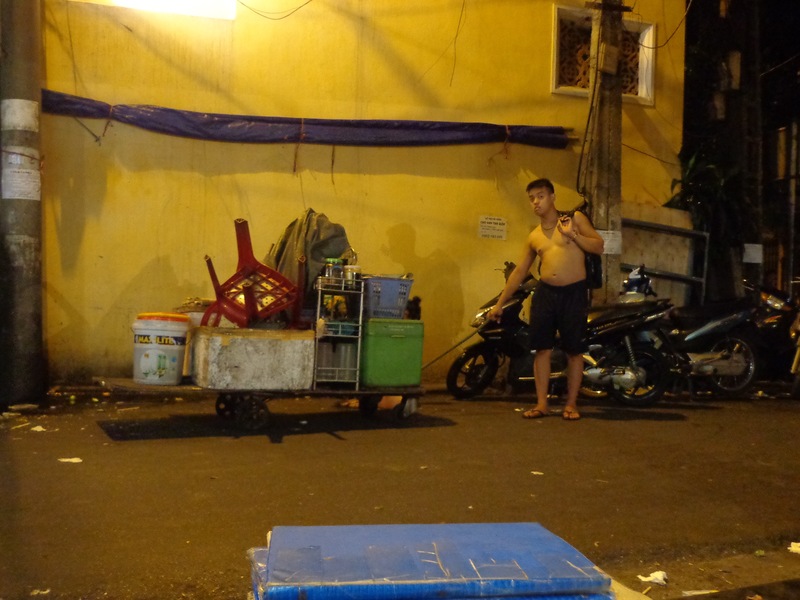 Hawkers acting as divider on the Hang Giay street. We ended up having our dinner at a temporary roadside stall. We barely made it as the owner was busy dismantling the tables and stools. By the time we were done, a lot of the road was freed up for next day’s use by the traffic. I took a portion of pork fried rice that texturally reminded me of Deepak-da’s fried rice in JCB Hall of IIT Kharagpur. Nandy was happy with his beef noodle soup. The tables, stools and utensils are washed and loaded on to these carts. The carts are simultaneously pulled by a human and pushed by the wheels of a two wheeler. Jugaad runs in even Vietnamese veins. I got to know from multiple sources that one cannot be careful enough with his cash and electronic items like camera and mobile phones. There have been cases of pickpocketing. Day 2: Ha Noi is full of good food and good surprises.